I'm very excited to launch a new feature here on Feeling Stitchy that I'm calling "Five questions with a manbroiderer". Today I'd like to highlight the work of Glenn Dragone, aka Spicy-Shots on Flickr. FS: When did you first start embroidering, and how did you become interested in the craft? GD: I started embroidering last April. Basically, I’ve always been attracted to things that are created with any form of needle and thread. I’ve been knitting for years. During a mindless meandering on the internet, I came across some antique redwork. I was fascinated by the simplicity and decided to give it a try. The embroidery evolved from that point. FS: How would you describe your style? GD: Since I’m rather new to the craft, I would call my style "ever-changing". I do gravitate towards 50’s and 60’s retro pieces. I also love classic illustration. FS: What is your favorite embroidery project that you've made? That someone else has made? GD: I was pleased with the Alice in Wonderland projects I’ve done. I like the original artwork and wanted to transform it into a 3 dimensional piece. There are tons of great embroidery artists out there. I have many favorites. FS: Do your friends / family / co-workers know that embroidery is a hobby of yours, or is it a "secret identity"? GD: Everyone knows that I have some sort of project in the works at all times. I am officially “out” and embrace my crafting. FS: Do you embroider in public? If so, what is the strangest / funniest / most interesting reaction you've gotten from others? GD: I’ve knit on a plane and haven’t really had any negative reactions. I do get the stares and the occasional .. “What are you making?” question from time to time. I would embroider in public. I just haven’t had the chance. Do you know any manbroiderers that should be featured here on Feeling Stitchy? Do you have any questions that you'd like our manbroiderers to answer? If so, please leave me a comment below! 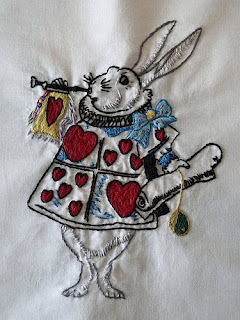 Lovely Alice in Wonderland embroideries! 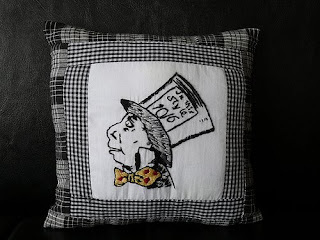 He does all kinds of crafty things but I thought his embroidered items were very special. LOVE the Alice pieces! Where did Glenn get the Alice patterns? Transfers? Made his own? I MUST KNOW!! MUST. STITCH. ALICE! 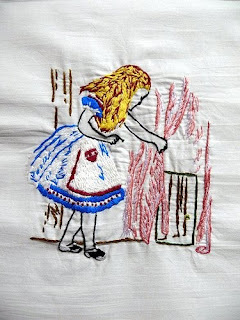 Fantastic 'Alice in Wonderland' himbroidery!! I used images from the original artwork. You just started in April? Wow, I'm impressed with your skill! Love the rabbit! 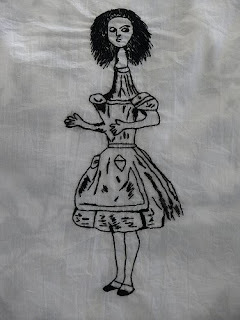 love, love Alice in Wonderland embroidery and anything Alice. ooh! I am so glad you interviewed him! I find him a little extra fascinating...I suppose because he has such a range of skills and interests. Thanks!